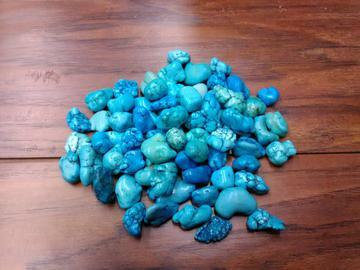 Turquonite is howlite that is permanently dyed blue to resemble turquoise. Turquonite balances and evens out mood fluctuations and brings inner peace. Because the stone is actually howlite, it has the properties of howlite of decreasing an overly critical state of mind, selfishness, stress, pain, and rudeness; increases sublety and tact. It is used in crystal healing to aid bones, teeth, calcium levels and leg cramps. It also heightens creativity. Stone Sizes Range From - 1/2" - 3/4"